A deep dive into incoming Cowboy wide receiver Langston Anderson’s skill set. 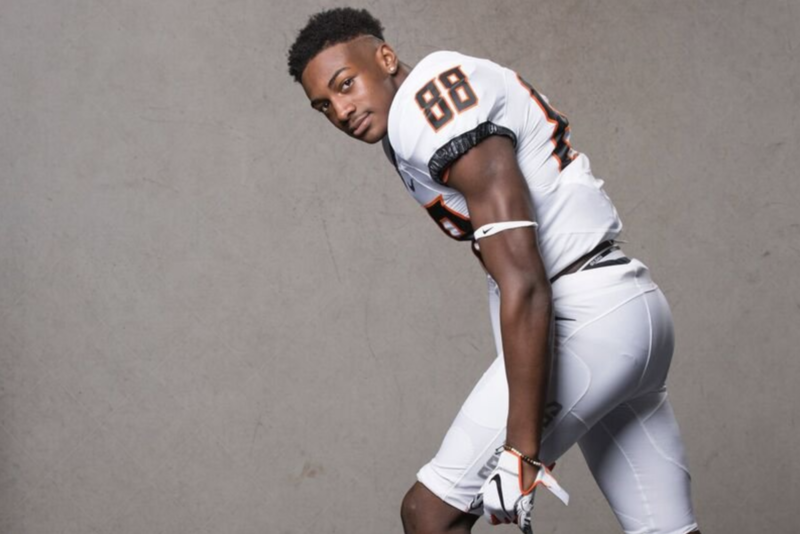 Similar to my film breakdowns on 2019 recruits Brendan Costello and Deondrick Glass, I wanted to dive a little deeper into my analysis of four-star wide receiver, and Oklahoma State signee Langston Anderson. A majority of the clips below will be from Anderson’s games against Carthage High School, who lost in the 4A Texas High School Playoff Semifinals, and La Vega High School, who won the 4A Texas High School Football Championship, to show Anderson’s performance against higher-caliber opponents. Anderson has the speed, running a 4.48 40-yard dash, and explosiveness to get by defenders and create separation off the snap. He also does a great job of changing his speed to create separation near the top of a deep route and still catch the ball in stride, as you can see in the clip below. He sometimes lacks that initial burst of speed, but overall he does a really good job of creating separation from his man when necessary based on the play design. The Midlothian Heritage product had many highlight reel-type catches during his high school career which displayed his size, physicality and overall willingness to get the football over a defender. Anderson does a great job of fighting for and gaining position and shows incredible concentration to come down with the football. Also, having a 39.5-inch vertical jump doesn’t hurt. He has the body control to catch the ball at the point needed, allowing him to win most contests with defensive backs. In addition, Anderson has great hand and upper body strength which allows him to rip the ball away from defenders or hold onto the ball upon initial contact. As I previously noted, Anderson was clocked at a 4.48 in the 40-yard dash. The Texas native has the top end speed to be a true deep threat for the Cowboys during his time in Stillwater, but also possesses the ability to turn shorter routes into home run plays. Additionally, he not only displayed this speed on deep balls, but in the kick return game as well, as shown below. Anderson was utilized a lot in the wide receiver screen game, as well as other quick route concepts like slants. I wouldn’t say he’s a route technician, but he does a solid job of breaking his routes effectively and creating separation from defenders, as shown in the following video. He will sometimes round his cuts, but is able to win the route due to his size and strength. Anderson also does a good job of manipulating defensive backs at the top of his routes and breaking back to the football. The young wideout is extremely explosive after the catch, as he displayed consistently in the screen game. In addition, he has nice open field elusiveness, possessing good lateral quickness and “make you miss” ability. Along with his ability to gain yards after the catch, Anderson was also a skilled runner out of the backfield. He’s a very strong runner who is difficult to bring down on initial contact, and he’s not afraid to get physical, as you can see below. From the film I watched, due to how wide his splits were (similar to the receivers in Art Briles Baylor offense) he was often instructed to run off his defender. Anderson was also asked to do a fair amount of “stalk” blocking. Stalk blocking is when a wide receiver drives hard at his defender giving the impression of a deep route, then once he closes the gap, the receiver will position himself between the receiver and where the ball is going in a breakdown stance similar to that of a basketball player. Like his running style, he’s not afraid to get physical and lay a block on someone. However, there were times when he didn’t have great effort or technique in the blocking game, and it’s definitely something he can improve upon at the next level. If you haven’t already noticed from the above clips, Anderson has exceptional hands. He consistently demonstrates the ability to extend his arms and grab the football out of the air. Watching full game film on Anderson, it was very rare to see him drop a ball, even on the more difficult catches. Overall, I am really excited about Anderson. He has nice size, great strength and is an incredibly dynamic player. The Midlothian Heritage star has some room for improvement, but he’s definitely one of the most, if not the most, talented players in the 2019 recruiting class. The Cowboys have a good amount of depth at the receiver spot, but I think he has the skills to contribute right away if called upon.